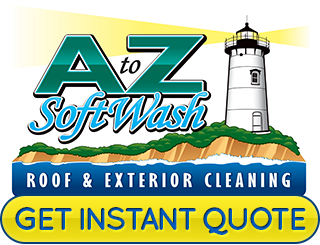 When it comes to high quality roof and exterior surface cleaning for your Little Compton home, A to Z Softwash is the only name you need to know. Our Cape Cod roof cleaning company takes great pride in the high quality cleaning work that we are able to provide to each and every one of our Rhode Island customers, and we believe that pride is evident in the excellent results that we are able to consistently deliver to all of our clients. 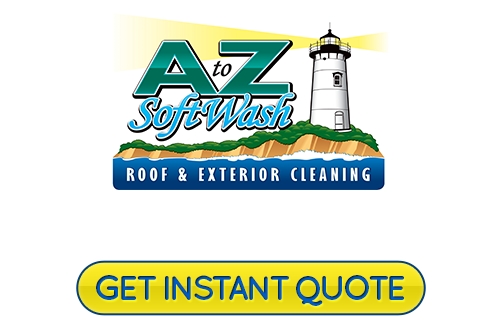 At A to Z Softwash, we are your team of local Little Compton roof cleaning specialists that are always willing to go the extra mile to make sure the job is done up to your standard of quality, as well as ours. Keeping your home's roofing and exterior surfaces in great condition is part of being a responsible homeowner. These exterior surfaces are extremely important to the overall function and security of your home, and as such, aren't jobs that you should entrust to just anyone. 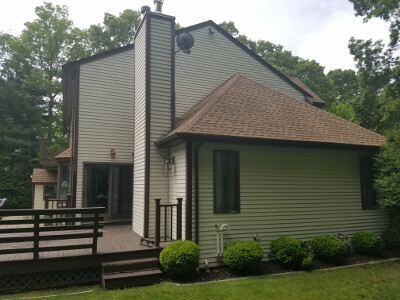 There are far too many homeowners that wind up having to replace their roofs or the siding on their home because a less than professional company came in and used a pressure washer in a spot that it shouldn't have been used on. Trusting someone without the right kind of experience for your home's roofing or exterior cleaning can wind up drastically shortening the lifespan of your surfaces to a much greater degree than whatever it was they were trying to clean off in the first place. Give us a call today if you have any questions about our full line of professional roofing and exterior pressure and soft washing services, or if you would like to schedule an appointment for your service with one of our qualified specialists. Our team of experts are always standing by and would be more than happy to do whatever they can to help meet your home's pressure washing needs. We look forward to working with you. Did you know that having algae, moss, or lichens on your roof can actually make your home less energy efficient? This buildup actually changes the way your home reflects sunlight, requiring you to run your air conditioning system more often to control the temperature. If you let black algae streaks go uncleaned for too long, it can actually result in the need for premature replacement of your entire roof. Cleaning at regular intervals is actually a much more cost effective option compared to having to replace the whole thing. There are a number of exterior surfaces of your home that can actually sustain damage from traditional pressure washing cleaning methods. Softwashing utilizes advanced techniques to get you the quality clean you want without the risk of damaging your roofing or siding. Don't take chances when it comes to the quality cleaning care of your home's exterior surfaces. If you are looking for a professional roof cleaning and pressure washing contractor in Little Compton, give us a call today at 508-209-7795 or fill out our online request form.